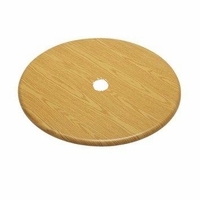 FREE SHIPPING - 36 Inch round pinewood palapa table for your palapa umbrella. Comes complete with mounting brackets. Ours is made from the same pinewood that our kits our made of so it matches perfectly not like others. We will core a 6 inch hole. You can also stain tables. Varnishing required.